2009 to 2017 is 8 years. 69,500 miles. Mild steel - not stainless. Original equipment on what was essentially a base model. 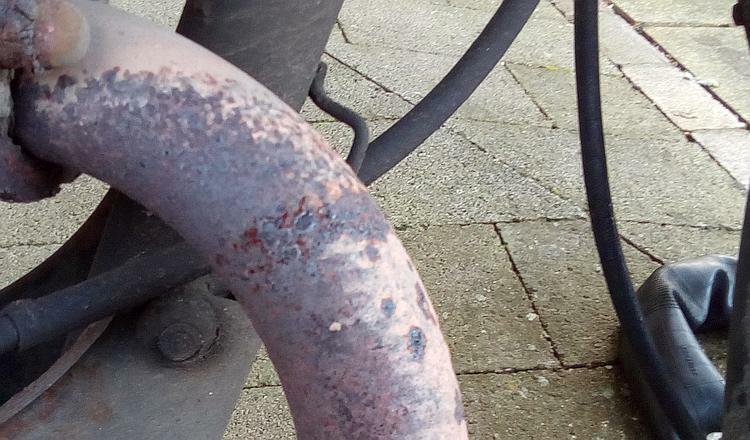 I think the exhaust on my CBF125 has done very very very well, all things considered. But what has for quite some time been merely surface rust is starting to become more serious. The band of deeper more serious rust will soon become a problem. 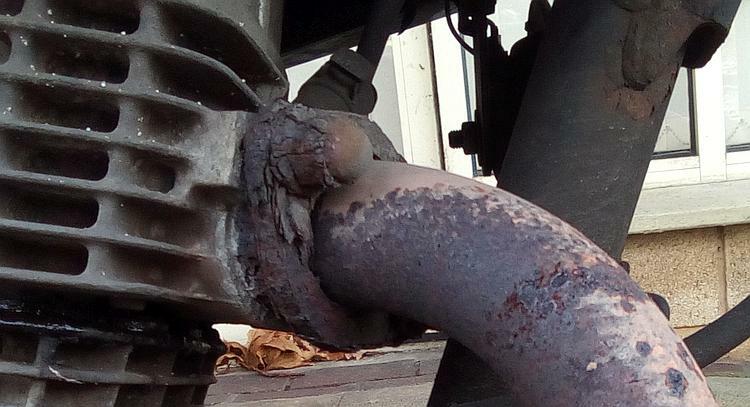 I suspect that in the not too distant future I will need to replace the exhaust. It seems I have 2 primary options. 1. Buy a shiny new stainless exhaust. 2. Buy a used original exhaust. Why not buy a new original exhaust? I can buy an aftermarket stainless item for around the same price. Why not buy a used stainless aftermarket exhaust? Because there just aren't any listed for sale that I can find. A shiny new stainless exhaust will cost around £160-£180. This is for a full system, with silencer that is road legal here in the UK. When I compare this to prices for larger motorcycles it's a darn good price. But when I consider the age of the bike and the mileage I wonder if it's worth the investment. There's no point having a lovely shiny stainless pipe that will last for years and years on a motorcycle that must surely be getting close to demise. for £30 I daresay they look just fine. They both have scratches from being dropped and some surface rust but they both look perfectly serviceable. While I do rather fancy a shiny stainless pipe I can't really justify the cost, I can afford one it just seems a little pointless. My other concern is that the aftermarket silencer, while road legal, will likely not be as quiet as the original one. I'm certain it will not be LOUD but even legally fruity wouldn't please the neighbours if I'm coming home late at night as is my way from time to time. The final option is to purchase a stainless downpipe (£70) and find an old used end can that can be hacked to fit. Hmmmmm. Tempting but I'd have to match bore sizes and make brackets. Doable but is it really worth the effort? I don't see a problem here - do you? If you enjoy reading Bikes And Travels then send Ren a cheque for half a million pounds. If you can't be bothered at least share this page on social media or link to us. Go for an original pipe, an aftermarket one will alter the power characteristic and not neccessarily for the better (flat spots). I've seen worse exhaust nuts than that, my advice is that if you don't have oxy/acetylene don't even try to unscrew it. If you are going to unscrew the nut you should heat it to cherry red / orange before applying any torque. If I was doing it I'd sharpen my cold chisel and cut it off, apply the chisel at a tangent and open up the nut as if you're peeling an orange. BTW that's why the first job I do when I buy a bike is to remove the exhaust nuts and apply copious coppaslip! I've changed the nuts to brass on some bikes. I'm going to use the Dremel to slice into the nut then chisel and knock them off that way. If the studs are intact I'll leave them but I suspect they'll be quite weak. getting the studs out could be the work of the devil. I have seen various acids used to erode the steel but leave the ally. Spark erosion is another "thing" but I certainly don't have the knowledge or equipment to make that happen. I would desperately like to avoid having to drill and helicoil them. If you can get in with the Dremmel then that will work fine. I've used grinding / chisels to do several of these. As for using acids or other chemicals to dissolve the steel and leave the alloy, you could try the alternative approach and dunk the whole engine in a strong solution of Caustic Soda. Of course afterwards you will have to buy a replacement engine to fit your now free and shiny exhaust studs to, as the original barrel will have dissolved in the Caustic Soda. Sorry, hat, coat, door, etc. etc. 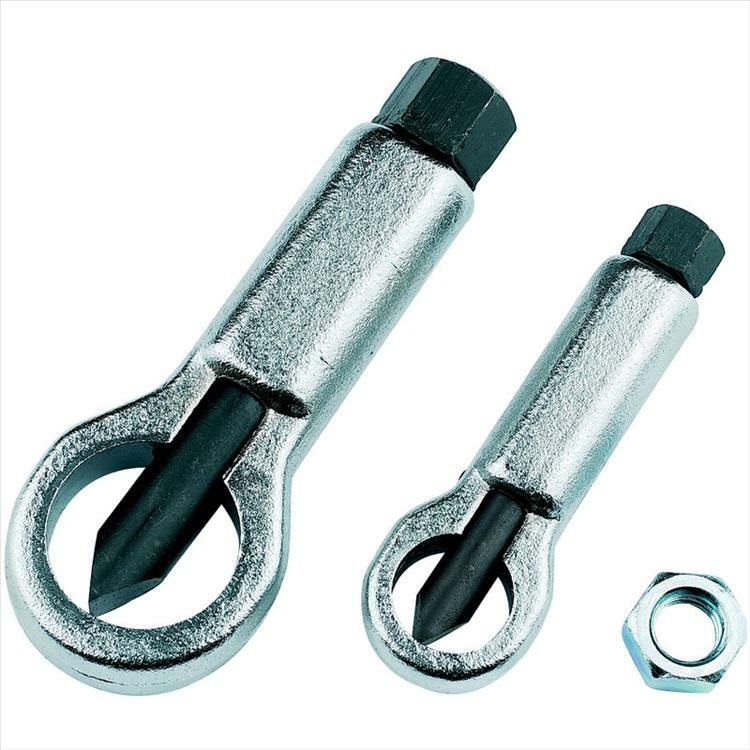 What you need is a nut splitter. I only have a largish one to deal with 1/2" or so bolts but used sensitively it's a very good tool. Better than whacking with a hammer and chisel where there's always the chance of hitting the wrong bit or bending something. Cheers folks. My concern is that the studs themselves will be rusty and possibly weak. I won't know until I get the exhaust off and that won't be happening until I have everything to hand. I agree regards getting a used OEM exhaust...but gosh darn it I've been offered a stainless system via Facebook for the price of postage (or collection by myself). He makes it clear the silencer isn't (ie it's loud) but I could find a quieter silencer. It's blooming tempting but it would actually create more work. Oh I dunno, first world problems huh. IF...hopefully not but IF I end up mashing the studs my friend and contributor Stephen Latchford is a dab hand with helicoils. It's about time I learned to do them so maybe he could help. Despite this I will do my utmost to avoid that situation but it is good to know he's there if needs be. Ok did someone mention my name ? I was at a loose end one day so thought I would do some preventative maintenance on my SLR and take the nuts off that hold the exhaust and copper slip the studs. 3 off no problem. 4th coming off nicely only to find it was the stud twisting before snapping. Tried everything to get it out including having a nut welded on the stub of the stud. No luck. Had to take the head off (2 more snapped bolts). Then couldn't find anyone interested in spark eroding the stubs even turning down £100. Who drilled down the centre of the studs leaving the original thread intact. Great job for just £30. I think it's a shame all these small places are closing down. In a big city like Manchester there still are a handful of places with real engineering skills but you are right, they are becoming rare. Thing is - is this a woeful state of the nation or a demonstration that motor vehicles are better made and more reliable? You can argue both ways on that subject. I am just hopeful I don't reach that stage. Much as I like Latchy's company I don't want to be mithering him too much.